Steinway Gallery Singapore’s Rising Stars Concert Series is a free monthly concert programme that strives to provide a platform for emerging performers to showcase their craft across all music genres. It is a unique musical set-up to identify and nurture a vibrant music community in Singapore. Young performers can unravel their imagination and put their best face forward in this showcase of pure, refined talent that is not limited to conventional frameworks, and is beyond the commercialisation of their craft. 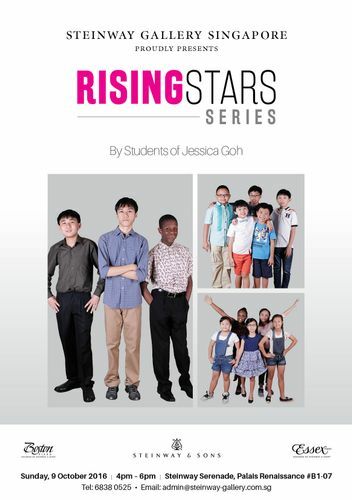 As part of the series, students under Jessica Goh would be performing in a piano recital at the Steinway Serenade, playing pieces from Alfred, Haydn, Beethoven, Schubert, Kaneda, Mercer, Alexander, Thurmong, Beyer, Williams, Churchill, Sherman, Horner, Uchida,Rachmaninoff.